This is what $345 looks like! It’s spring and we are going to start the riding season by doing a little maintenance on our two Harley-Davidson Dyna motorcycles. My 2007 Dyna Low Rider is in need of a new battery. That was a little pricey at $129. There are some tools here at $48. Got a new air filter for Diana’s Super Glide. Picked up new spark plugs and oil filters. Got a flat style derby cover gasket for my new derby cover Diana got me for Christmas. Got six new o-rings for the oil drain plugs. Got 9 quarts of SYN3. Purchased some anti seize lubricant at the local Advanced Auto Parts store. Also picked up an oil pan. Found my spark plug gap tool. I think we are ready to practice the art of motorcycle maintenance. No matter how much we talk about motorcycle tire pressure it probably still won’t be enough. How much is enough? Check your factory authorized service manual! Tires and the air inside them should not be taken for granted. I bet most motorcyclists don’t take the time to check them as often as they should. They take them for granted! I’m not going to go through the advantages of having properly maintained tires or even the liabilities of not having them. It should be common sense! What I do want to point out is: there are gremlins waiting to steal from you so you need to check the air pressure on a regular basis and have an air compressor at home to adjust as needed. 1. The Grime Gremlin! After having a new tubeless front tire installed on Diana’s Dyna Super Glide it didn’t seem to hold air well. I only knew this from checking the pressure on a regular basis. I was pretty sure the tire was good but didn’t trust taking it back to where I had the tire installed. I feared they would not be honest with me and would automatically charge me to install a new one. I found a trustworthy motorcycle mechanic by asking around. He sprayed the full diameter of the rim with soapy water demonstrating that air was leaking out around the tire bead! There was not an air tight seal due to tire grime that had built up on the rim. Considering this is only a three year old motorcycle, imagine the grime that could be on your wheels. It took a good amount of elbow grease to clean that rim and at the hourly rate of most mechanics and today’s work ethic I doubt anyone would have taken the time to do it until it became a problem. 2. 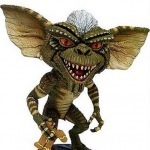 The Stemlin Gremlin! I was checking the pressure on my brand new front tire and found it was just a little light again! This time I noticed the stem kept hissing. It sounded like an angry gremlin! or escaping air! I pressed it in and out a few times until it settled down and stopped making so much noise. I’ll have to have a professional adjust it. 3. The Puncture Gremlin! My back tire is not holding air well! Several pounds low again! While checking the pressure the answer staired back at me. It was a most evil looking industrial staple with two fangs of steel that had penetrated through the benevolent Dunlop. I had been screwed and nailed before by single toothed monsters like this, but never taken a double hit like this! The only way to know if you are being robbed of this precious commodity we take for granted… is to stop taking it for granted! Check check check your “cold” air pressure at home before you hit the road. Have an air compressor handy to make the needed adjustments. I invested in a small travel size compressor I keep in my saddlebag and also a shop size one at home. After I got it I couldn’t believe I lived for so long without it. Remember the Martin Lawrence scene in Wild Hogs? Now I can adjust the tire pressure on our cars and truck too! Summer will be here soon and I’ll be able to blow up the inflatable swimming pool and accessories! Don’t take air or the ability to blow things up for granted!!!! I learned a lot about maintenance in the past few months. After hanging up my spurs all winter I found that not only was my bike in need of maintenance but my body had become weak. I have become another white collar coach potato. Sitting at a computer all day has wrecked my eyes and my core body strength. I can cope with wearing glasses but I will not succumb to a walker quite yet. Coming home and sitting in front of the flat screen watching NCIS and Special Victims did not help matters… nor does driving, riding or blogging… all sitting activities. Not good for the mid section! Those muscles have gone for a ride deep south and my occasional arm curl and bench press workouts have not helped keep a strong mid section. After a bout with sciatica I started seeing a chiropractor… after seeing stars a few times. After a few visits, adjustments and PT sessions I started getting better. I have been doing the PT exercises at home and trying to walk around my neighborhood as often as possible (I wish I could do it everyday but weather and work emergencies don’t always allow for it). I’m getting stronger. A strong mid section is important and will aid in riding my motorcycle. I used to consider walking and simple PT exercises wimpy activities compared running and pumping iron. But now that I am in my mid forties I see great importance in keeping these muscles maintained and ready. I’ll do the simple exercises because I can see what happens if I don’t when I visit my Mom at the rehab center. I’m not looking to get ripped anymore, I just want to age gracefully. I don’t want to suffer from back pain or lose the body strength needed for basic day to day activities; like going to the bathroom! I’m going to keep working my midsection. I’m going to incorporate some fun equipment I would not have deemed real workout equipment a few months ago. Like medicine balls and those big bouncy beach ball things. I’m even looking at the Kettleworx workout as a potential exercise routine. When I get a little stronger I’ll have to face the fact that I’m going to have to work on my cardio conditioning which has also gone on vacation. Gotta fight off middle age coach potato syndrome and keep my machine well maintained for the long haul.